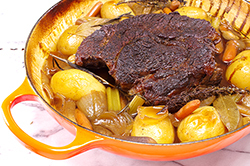 While termed a “roast,” a classic pot roast is actually braised instead of roasted. 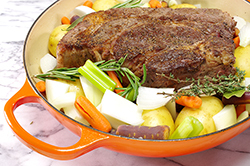 Braising techniques use low temperatures in a moist environment. 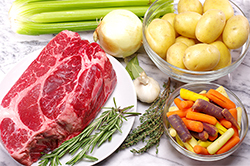 The “low and slow” process tenderizes otherwise tough cuts of meat transforming them into fork tender bites with plenty of flavor. 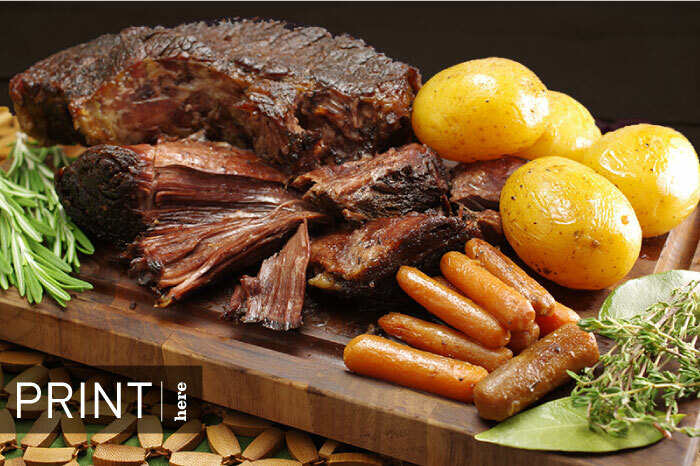 The classic pot roast was once the go-to menu for Sundays; the meat and vegetables simmered in a covered roaster while the family was at church. Once home from the morning’s activities, Sunday dinner was ready. It’s a formula that still works well for busy schedules any day of the week! 2. Prepare the roast by trimming away extra fat on the perimeter, and patting the roast dry. Generously sprinkle with salt and black pepper. In a large Dutch oven or braiser, heat the olive oil until hot and shimmering. Sear the roast on all sides until browned. Drain any excess fat that’s been rendered. 3. Add the carrots, potatoes, onion, celery, and garlic to the pan. Add the red wine and beef stock to the pan. Add the thyme sprigs, rosemary springs, and bay leaves tucking them in between the vegetables. 4. 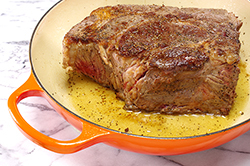 Cover the pot and place in the oven for 3-4 hours, (or about 45 minutes per pound), until the meat is fork tender. 5. Remove the roast to a platter and loosely tent with aluminum foil. With a slotted spoon, remove the vegetables. 6. Skim away any excess fat from the pot. Transform the remaining pan juices into a thin gravy on the stovetop by heating until bubbling. Add an additional cup of beef stock (or additional stock to make a total of 3 cups of liquid) and reduce by half leaving approximately 1-1/2 cups of liquid. Massage the softened butter and flour together into a paste making a beurre manie; divide into 4 pieces. Add one piece at a time to the simmering pan juices, stirring continuously until thickened. Season with salt and pepper to taste. Serve on the side.